If you want to buy into Intel’s sixth-gen Skylake CPU range, you’ll also need a motherboard featuring the new LGA 1151 socket to pop it in. 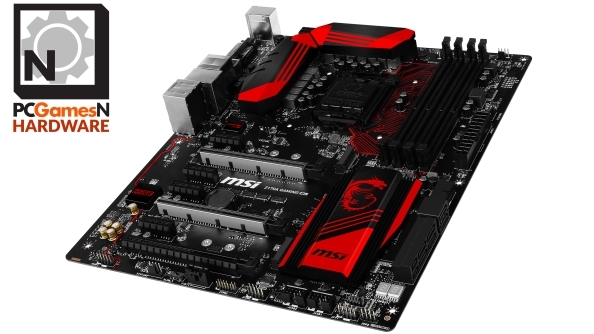 If the Skylake CPU in question also ends in a ‘K’ and you have plans to overclock it, MSI’s Z170A Gaming M5 mobo is designed for you. Intended for enthusiast-level gamers, it’s certainly endowed with an impressive spec sheet, but does that translate to an impressive real world user experience? PCGamesN puts it to the test. Considering a less dramatic hardware upgrade? Check out our best PC gaming mice. Let’s start with the features list. Priced at a competitive £150, the Z170A Gaming M5 has obviously been designed with future-proofing in mind, offering six SATA 3 6GB/s ports, 2x USB, 4x USB3, and 2x USB 3.1 connections, and 2x M.2 expansion slots for PCI or SATA SSDs. There’s plenty of space in the layout of these slots to allow for stacked memory or SSDs with large heat spreaders. In similarly future-proof fashion, the board supports up to 64GB of DDR4 RAM operating at up to 3600MHz when overclocked. Three PCI slots grace the board, allowing for three-way SLI/CrossFire setups. In short: all the features you’d realistically be looking out for when building a new system. It’s a relatively easy board to install, too. MSI have smartly limited the dimensions of the heatsink, particularly vertically, to avoid complications when installing a fan to your CPU. It was easy to fit a Corsair H105 liquid cooler’s cradle and affix the water block – a feat I’ve had real difficulty completing with other boards. Positioning the USB3 header to the bottom right of the board also minimises fiddling and avoid taut wiring. Extra kudos is due to MSI for adding additional support to the PCI slots to keep heavy GPUs from straining their fittings. It’s worth noting that the speeds of each PCI slot vary depending on the number of connected GPUs – the top slot operates at x16 speed, but when a second card is added it operates at x8. With three graphics cards connected, that becomes x8 x8 x4. It’s something to bear in mind if you intend to build a three-card setup around this board, but it shouldn’t necessarily put you off. I didn’t notice a performance dropoff running two GTX 970s in SLI in x8 x8 in comparison to my previous mobo’s x16 x16 operating speeds, and generally this shouldn’t impact frame rates. The only apparent oversight in the Z170A Gaming M5’s construction is in its back panel. In the name of maintaining its ubiquitous black and red colour scheme, the 5.1 audio connectors don’t carry the usual colour code. They are, as the more astute will already have surmised, black and red. Connecting the cables correctly takes some trial and error as a result. With the mobo itself successfully installed and housing our reference hardware – an Intel Core i7 6700K CPU, 2x NVIDIA GTX 970 and 16GB DDR4 RAM – the next area of inspection is the BIOS. While I’m not personally enamoured with the flaming dragon that greets the eye by default after the POST screen, the BIOS itself is pretty user-friendly. Two tantalising buttons dominate the ‘easy’ mode screen: Game Boost and XMP. These are one-click overclocking options for your CPU and RAM, respectively, auto-tweaking clock speed and voltage settings. While XMP worked without a hitch for me, I found that Game Boost caused my system to become unstable while overclocking the CPU to a moderate 4.55 GHz. This doesn’t represent the ceiling of the board’s overclocking potential though – I was able to get the CPU running at a stable 4.6GHz by modifying the BCLK multiplier myself, so can only conclude that Game Boost’s voltage tweaks were causing instability. I reached out to MSI for clarification on how Game Boost works and whether there’s some way to change its parameters within the BIOS’s advanced settings. They explained that Game Boost uses presets for each model of CPU, which work “9/10” times. As with all overclocking, in the end it comes down to whether you got lucky with your individual piece of silicon, and mine just wasn’t happy with that preset. It can’t be modified elsewhere in the BIOS, either. However, in the grand scheme this is a minor point. I achieved 4.6GHz stable with no voltage adjustment, simply by heading into the BIOS’s advanced settings (way more user-friendly than the name suggests) and boosting the BCLK multiplier to 46. With further exploration of the advanced settings and a little voltage tweak, 4.7GHz looks totally possible. I’ll be reporting back with my results. How does that overclocking affect real-world performance? I’m really glad you asked, hypothetical individual, because I spent quite a long time running benchmark tests to quantify that exact question. The results show a small gain in gaming performance, and a more pronounced performance gap in CPU-intensive tasks. It’s an encouraging set of figures, indicating high quality circuitry. However, it’s more often the little niggles during everyday usage than outright performance numbers that shape your opinion of a mobo. In the Z170A Gaming M5’s case, I found a single, fixable issue: after installing all the required chipset, USB and Ethernet drivers, I found that Windows 10 tried and failed to recognise the ASMedia USB hub over and over. However, disabling the hub in Windows Device Manager ended that irritating cycle of OS notification sounds, and all my connected devices work fine (I’m occupying every USB slot bar the 3.1). Elsewhere, the Z170A Gaming M5 is free of the usual blights of modern motherboards – there’s little to no capacitor ‘squeak,’ even running overclocked at heavy loads, and best of all, all USB devices power down as they’re supposed to when the PC’s shut down. As someone for whom it’s become wearying habit to unplug either mouse or keyboard every night, I can’t tell you how happy that makes me. 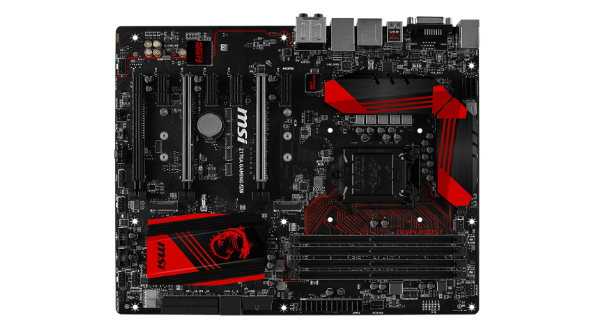 MSI’s Z170A Gaming M5 lives up to its name, offering gamers all the tools and features to make good use of an unlocked Skylake CPU and future-proof their system for the next few years. 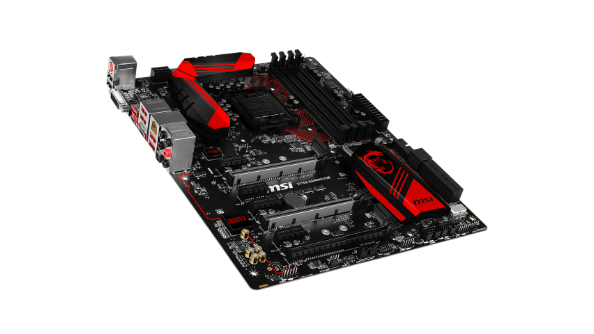 With a well-designed BIOS full of options, plenty of SATA and USB connectivity and only a couple of very minor issues that we were able to resolve, it’s a fine foundation for your new Skylake machine.